Very interesting with a new release from a band who are based on Christian ideas and foundation, and their songs and lyrics are all about Christian themes, but you can be sure that they do it in their own brutal, angry and aggressive way. 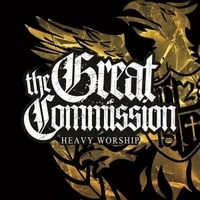 Even the album is titled Heavy Worship, and vocalist Justin Singh preaches with deep growls in the opener Don't Go To Church, Be The Church with an ultra metal core style to convince nonbelievers of the qualities of The Great Commission. The name comes from the tale of Jesus Christ who instructed his Disciples to go and spread the Teachings around the world, and this is known as The Great Commission, so it is a big task the American band has taken. Preaches To The Choir is super raw metal with a touch of punk and mega heaviness and gives a good impression of what the band is all about. Weight Of The World is very aggressive and melodic metal with fine guitar work. Also the song Road To Damascus have this aggressive content of pure raw metal and is a perfect song for The Great Commission.